Editor’s note: This blog is one of a series of travelogues by HMNS VP of Astronomy Carolyn Sumners, sent from the two-week solar eclipse viewing trip she led to Australia. Hold the boomerang with the painted side toward you. When you release the boomerang, give it as much spin as possible. Hook your index finger around the tip. Holding the boomerang firmly, let it tilt back against your wrist. When releasing the boomerang, give it a quick throw — keeping your hand closed so the boomerang rolls around your index finger and is aimed slightly upward. For a real wooden two-bladed boomerang, you need a large open area for throwing. You will improve by increasing the spin of the boomerang and getting the best angle relative to the wind. Catch a returning boomerang by bringing your open hands together on either side of the spinning boomerang. 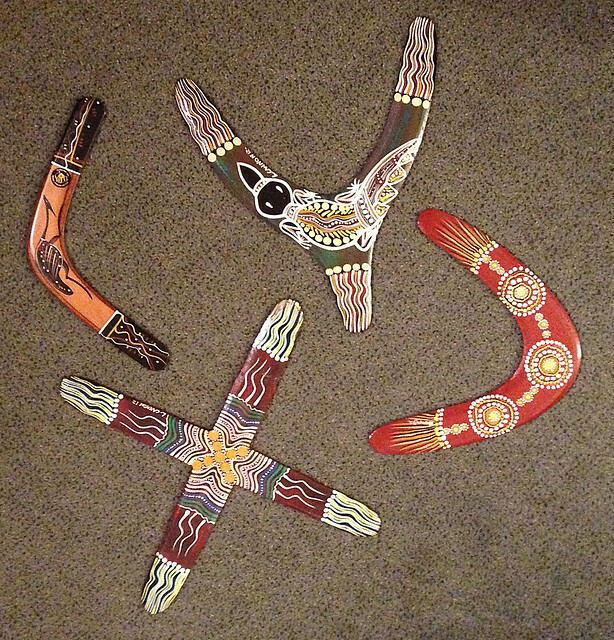 Real boomerangs come in various shapes with two, three, or four blades. Boomerangs are often used to knock birds out of trees and will not usually come back after impacting with another object. If you want a boomerang that returns in a very small space and cannot hurt anyone, use the attached pattern for a 4-bladed boomerang. 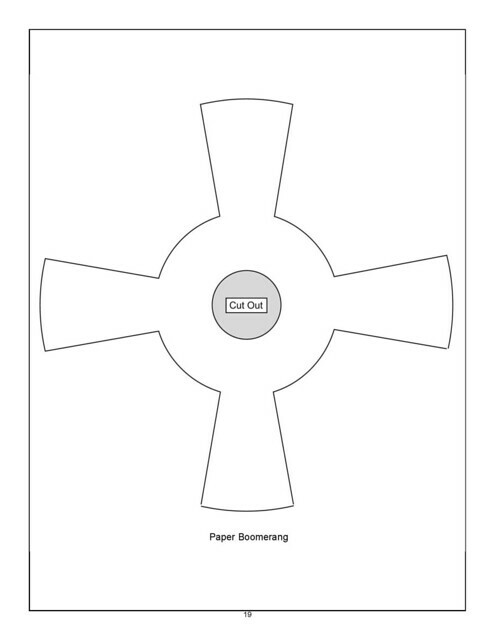 Draw the boomerang pattern on card stock and cut it out. Curve the blades inward, shaping the boomerang as a plate or shallow bowl. Hold the boomerang vertically with the tip of one blade between your index finger and thumb. Tilt the boomerang back until it touches your wrist. The inward curve of the blades should face the center of your body. 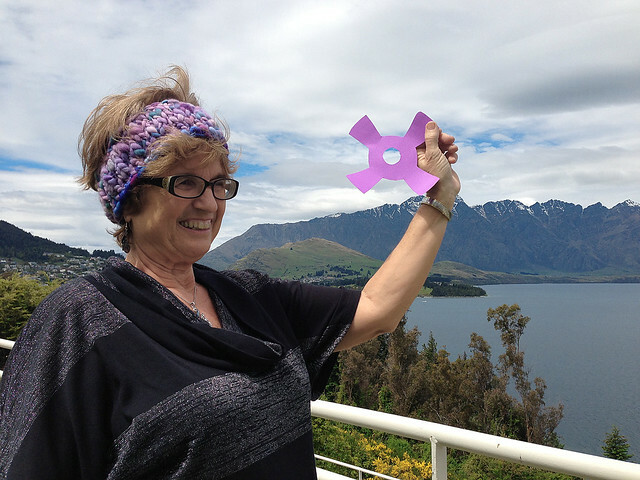 In my photo (taken in New Zealand, where we finally practiced our boomerang throwing), you can see the proper position for a left-handed thrower. The right-handed throw is the same, with the boomerang blades still curving inward. Flip the boomerang straightforward with as much vertical spin as you can. When thrown with enough spin, this boomerang will always turn from vertical to horizontal and come back to you. Usually this will happen within 10 feet of you. This boomerang can also be decorated and hung on a tree for the holidays! 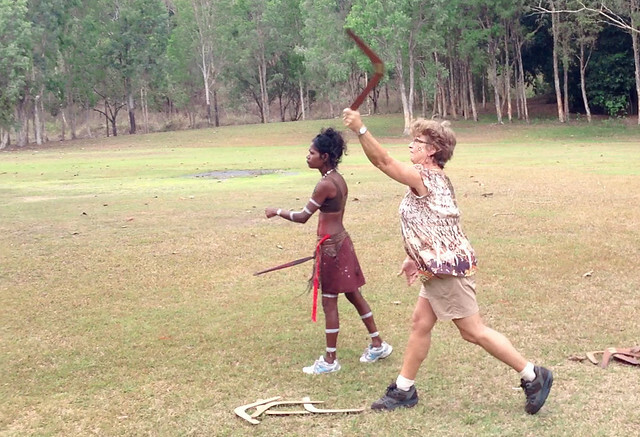 Make boomerangs for the whole family and start a new holiday tradition from down under. Next Post The stars at night are big and bright, deep in . . . New Zealand?